Press and hold the top capture button for at least 1 second, the top LED will change its color to pink. Adjust the gain by pushing the '+/-' buttons at the rear side of Mikme. You can set the gain from 0-30 dB. Whatever you may want to record (e.g. your voice), speak/sing into the microphone and adjust the gain so that the top LED never gets dark. If the LED is flashing the gain is too high and the audio signal is distorted. If that happens press the '-' button 2-3 times to set a lower gain; wait until the top capture button LED is not flashing any longer while you're speaking or singing. Once you find the right gain save it by pushing the top capture button shortly and the top buttons LED will change its color again back to either white or blue. 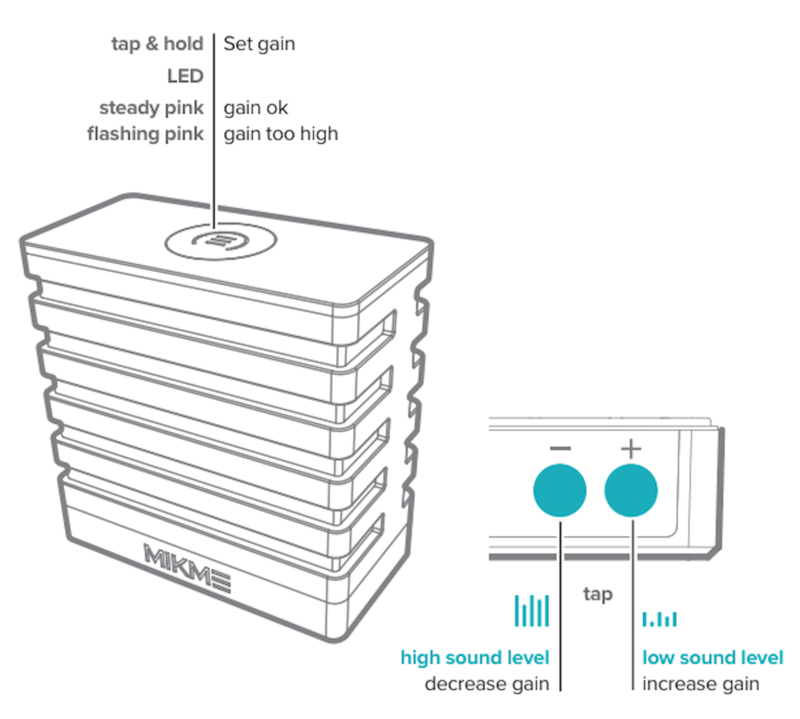 The gain is saved in your Mikme Microphone for future recordings, even if you switch off the Mikme Microphone. Even though we wouldn't recommend to set the gain during a running recording (as one surely will hear the button noise), you still can quickly adjust Mikme's gain setting on the fly. Here´s how.